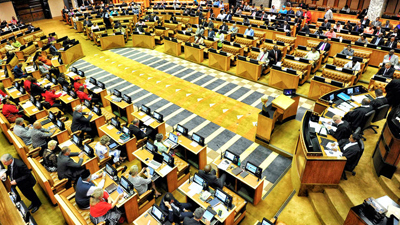 ANC MPs implicated in Bosasa scandal willing to testify - SABC News - Breaking news, special reports, world, business, sport coverage of all South African current events. Africa's news leader. The role of the committee is to investigate the conduct of MPs including those who fail to declare their interests to the Registrar. ANC Members of Parliament who made recent headlines after allegedly benefiting from the Bosasa security company are willing to appear before Parliament’s Ethics Committee. This is according to the Office of the ANC Chief Whip in Parliament. Bosasa allegedly installed CCTV security systems at the homes of Communications Minister Nomvula Mokonyane, Mineral Resources Minister Gwede Mantashe and Correctional Services Deputy Minister Thabang Makwetla. The role of the committee is to investigate the conduct of MPs, including those who fail to declare their interests to the Registrar. ANC MP Vincent Smith says he is happy that the ANC Political Committee has granted him the request to step aside as chairperson on three committees. The ANC’s Political Committee took the decision on Wednesday when ANC Chief Whip Jackson Mthembu presented Smith’s request. The Ethics Committee will investigate Smith’s conduct after he allegedly received payments of close to R700 000 from Bosasa security company. But, Mthembu says Smith will continue to serve as a ordinary member in the committees. This entry was posted on 13 Sep 2018,05:14PM at 5:14 PM and is filed under Politics. You can follow any responses to this entry through the RSS 2.0 feed. Both comments and pings are currently closed.